Legislative leaders, Governor reach agreement in principle on historic education funding reform. 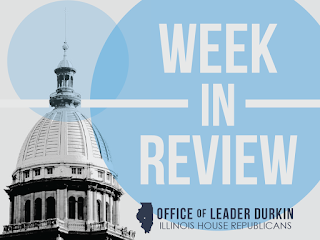 The four caucuses’ legislative leaders negotiated face-to-face this week on a path forward for Illinois’ public school funding formula. An agreement in principle was announced on Thursday, August 24. Under the agreement in principle, which has not yet been approved by either house of the General Assembly, Illinois will adopt an “evidence-based” school funding formula. Evidence-based school funding will fold in many supplemental grant programs that have become permanent pieces of the school funding system, and will provide additional incentives to school districts to improve pupil performance. 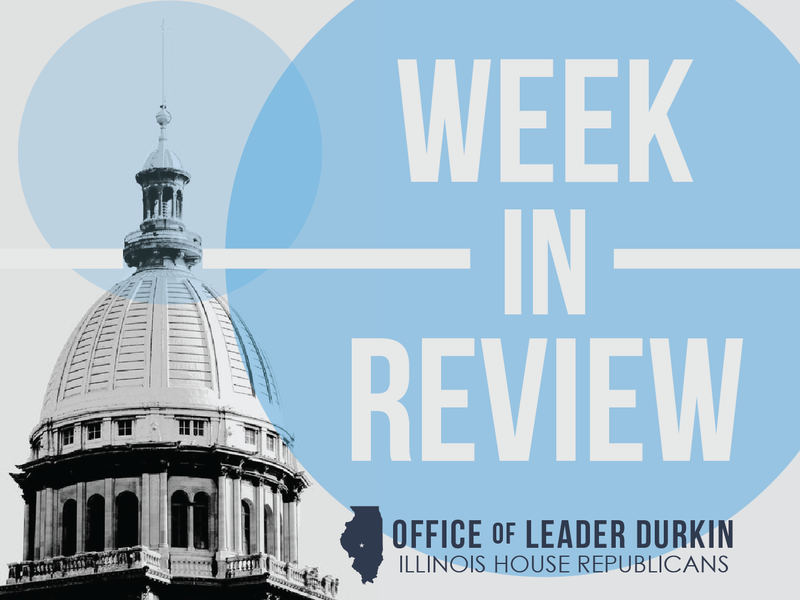 The Illinois House of Representatives is scheduled to convene in session on Monday, August 28, to consider passage of the education funding reform proposal. Springfield’s Lincoln Presidential Library granted autonomy. The new Abraham Lincoln Presidential Library and Museum Act makes the much-visited library-and-museum complex an independent agency of the State of Illinois. The grant of autonomy to the presidential complex moves it toward a status that is closer to the level enjoyed by other U.S. presidential libraries. As the head of an independent agency, the director of the Lincoln Library and Museum will have additional standing to solicit support from the private sector, potentially reducing the need for taxpayer funding. The Lincoln Library bill, HB 136, was approved by the House in April 2017, and was signed by Gov. Bruce Rauner on Friday, August 18. House Republicans Tim Butler and Sara Wojcicki Jimenez, who represent the Library and Museum’s home city of Springfield, co-sponsored the bill to create the new law. State panel approves new science standards for Illinois students. A decision by the Illinois State Board of Education (ISBE) clears the way for full 2017-18 implementation of the Illinois Science Assessment. Advocates assert that Illinois schools need to increase their implementation of science education in line with STEM-oriented college curricula. The Assessment will also counterbalance current standardized-test public school routines that concentrate more on mathematics and English-language skills. Science, technology, engineering, and mathematics (STEM) learning is an increasing focus of many college concentrations and courses, including majors that have traditionally not been STEM-oriented such as business, economics, and sales management. The Illinois Science Assessment, which will be a new test for some Illinois public school students, has been extensively pilot-modeled within the public education community. Many public schools have already administered the test to their students. In the first rounds of pilot testing, only 39% of Illinois high school students passed the test. ISBE stated that they will increase their outreach to Illinois public school districts to help teachers adjust their curriculums to the new method of measurement. The Assessment will test basic concepts used by scientists in disciplines taught in many high schools, such as chemistry and biology. Under the new ISBE standards, different iterations of the test will be administered in grades 5, 8, and at the high school level (typically at grade 11). Planned high-tension power line hits serious snag. The planned 3,500-megawatt high-tension power line has been proposed to deliver electricity from Kansas to western Indiana. Crossing Missouri and Illinois, the projected 780-mile-long Grain Belt Express would be used to deliver wind-generated energy from the Great Plains to the northeastern United States. Beneficiaries would include electricity suppliers and their customers in places like Ohio and western Pennsylvania where power has traditionally been generated from burning coal. Many Illinois residents, along the route to be followed by the Grain Belt Express high-tension line have expressed concern about health threats that the electric line could generate. The line would run through many counties and small cities in central and southern Illinois, including Alton and Effingham. In a move that is significant to the entire length of the projected line, the Missouri Public Service Commission (Missouri PSC) has rejected the application by Grain Belt Express to run the line through the “Show Me State.” This move marked the second time that Missouri PSC has rejected Grain Belt’s application, and the repeated position places completion of the line, may now be under some pressure to change the parameters of its proposal, or to drop the project altogether. New rules will require customers to accept, or opt out of, counseling at each pharmacy transaction. The new rules follow a Chicago Tribune investigation, published in December 2016, which showed that it was possible for customers with valid prescriptions to purchase drugs in Illinois pharmacies even though their consumption of these pharmaceuticals could lead to harmful drug interactions. Pharmacists say that Illinois residents are often uninformed about drugs. Furthermore, consumers are bombarded with information from now-ubiquitous pharmaceutical advertising. New pharmacy safety regulations have been approved by Governor Bruce Rauner. Many pharmacies have already briefed their personnel on the new rules, which were developed with the cooperation of the pharmaceutical profession. The new rules create an automatic template in which it will be assumed that a customer will receive additional information at each transaction. Information that customers, especially customers who are buying a drug for the first time, should be careful to get includes counseling on potential side effects of the drug they will take, and information on drugs and other substances that persons taking this drug should not consume. Customers, especially repeat customers who are refilling a prescription, will have the right to refuse counseling. Wehrli-sponsored pension double-dipping elimination bill signed into law. Governor Rauner Thursday signed House Bill 418, which prevents retired police officers from opting into the pension system a second time if they return to the force as a police chief or join another municipality’s force. This bill will protect taxpayers from situations in which police officers are collecting two pensions from the same pension fund — a problem known as “double dipping.” Police officers that are promoted to police chief or join a different force will enroll in 401(k)-style retirement plans instead of opting into the pension fund again. The bill was sponsored by two Naperville Republicans after controversy over whether a Naperville police chief should be able to accrue new pension payments while simultaneously earning a salary of over $168,000 and collecting payments from his first pension. Nonprofit healthcare network announces headquarters consolidation in Lisle. Amita Health, which currently leases office space in Arlington Heights, Bolingbrook, Elk Grove Village, Hoffman Estates, and other Chicago-area locations, announced plans this week to consolidate its 1,100-member executive team in a centralized location in Lisle, Illinois. The consolidation will refill an underutilized DuPage County office complex occupied by Illinois-based truck maker Navistar. Amita Health will utilize 225,000 square feet of executive office space historically used by Navistar. Amita, a nonprofit healthcare management entity, is one of the largest healthcare networks in Illinois. The network represents and serves as the headquarters partner for a wide variety of hospitals and outpatient care facilities that perform healthcare work under a variety of names and titles. The Amita consolidation will be carried out in stages according to a plan set to reach full implementation in July 2018. House Republican Cook County soda pop tax repeal bill scheduled for hearing. The controversial penny-per-ounce Cook County excise tax on “sweetened beverages” is now in effect. The tax is highly unpopular among retailers and consumers. Retailers are especially hard-hit because consumers can sidestep the tax by purchasing beverages in Chicago’s collar counties. Furthermore, the tax imposes a “sin tax” stigma on beverages such as soda pop or sweetened iced tea that is similar to the tax stigma on cigarettes or alcohol. House Republicans, led by Rep. Michael McAuliffe, have filed HB 4082 to repeal the unpopular pop tax. The tax was imposed on consumers starting on August 2, but HB 4082 would roll it back and forbid Cook County (or any other home-rule unit) from enacting a replacement levy. The bill would force Cook County and its board chairperson, Toni Preckwinkle, to cut spending or find some other way to balance their budget. HB 4082 has been assigned to committee for further discussion, and a hearing date of Tuesday, August 29 has been posted for the measure. Southern Illinois’ state fair, August 25 through September 4. The DuQuoin State Fair, a celebration of Southern Illinois’ heritage, marks the end of the 2017 summer season. The DuQuoin State Fairgrounds, headquarters of the festivities, are located 20 miles west of Interstate 57’s Exit 71, and within easy driving distance of St. Louis and its Illinois Metro-East region. In addition to the standardbred horse racing card, there will be a full schedule of concerts, stock car events, truck and tractor pulls, and a demolition derby. Fair rides and festival food will be offered by vendors.